With MAC becoming more and more popular, even in A/E/C markets, how do MAC users (I'm one of them) work in a largely PC dominated workplace? We'll be keying on Buzzsaw usage with a MAC in this post. Here's how we manage to use Buzzsaw on a MAC. First things first, Orange Blade Consultants' main activities involves Autodesk Buzzsaw training and consulting (Site Setup, administrator training, member training, trade partner training, custom business processes, etc). Our most important applications - Buzzsaw, Autodesk Design Review (the free viewer for doing takeoffs and printing plans from buzzsaw), and Microsoft Infopath (Microsoft App for designing custom Business Processes) are made for the PC. There is a "web version" of Buzzsaw (pictured below). The web version is made available for those using web browsers other than Internet Explorer. My browser is Safari, and sometimes Firefox. You can use Buzzsaw on a MAC within these browsers. When using this web version, you are visiting a web page with an assortment of links. You can upload/download files (if you have the proper permissions to do so), Size information about a files, see the size of the file. However, I'll tell you that we prefer the client version of Buzzsaw better (pictured below). The client version just feels right. 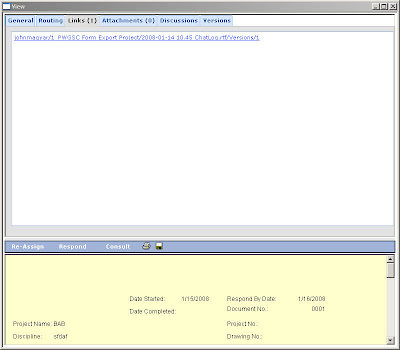 It has all the familiar tools and everything has it's place........feels like I'm using Microsoft Outlook. It's easy, and that's what I'm after. With the client version, I can drag-and-drop files to/from Buzzsaw. I can view files within the Buzzsaw view window. I can email from within buzzsaw. I have the Find function available to me.....etc,etc. So how do we manage to use this client version on MACs? There is more than one answer. Our answer has been a product from VMWare, named VMWare Fusion(http://www.vmware.com/products/fusion/). In essence, I run Windows (XP, but other Windows versions will run with Fusion) simultaneously with Leopard (the latest MAC OS). And it runs flawlessly. Truly the best of both worlds. All of the features of the MAC that I love with all the benefits of Windows that I need. We paid $79 for Fusion back in November 2007. Well worth the price. Note: You must also have a version of Windows available to run windows on your MAC. There is also "Boot Camp" (http://www.apple.com/getamac/windows.html). Boot Camp comes with the latest MAC OS. Bootcamp will run Windows on a MAC. The downside is that you are booting to MAC, or you are booting to Windows. Fusion lets both MAC and Windows run simultaneously. You can bounce from MAC apps to Windows Apps, share drives, printers, external peripherals, etc. There is also another product by the name Parallels (http://www.parallels.com/). I've heard good things about Parallels, and it will run Buzzsaw in a Windows environment. We've chosen VMware Fusion, and we're sticking with it. But for those considering one of these Windows virtual machines on their MAC, check both of them out. 30-trial versions available form their respective websites. Regardless of how you run Windows and Buzzsaw on your MAC, just do it. The price is well worth it. It's great having the best of both operating systems. 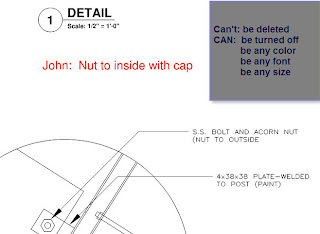 These symbols are drag-n-drop, able to be enlarged or reduced, sharable on a network, rotatable, and many can accept text such as a detail number or section number. 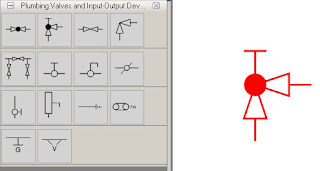 Do you have an existing symbol library or Autocad Block Library? You can make a Bluebeam toolset from them. Stayed tuned for a post showing how this is done! Call us for volume discounts and more information on Bluebeam PDF Revu. In 2004/2005 when homebuilders couldn't build fast enough in some parts of the US. Plans were distributed faster, changes were relayed faster, we got away from doing takeoffs from paper plans and elevations (by learning to use Autodesk Design Review). Using Buzzsaw made so much sense. Fast forward to 2008. It's no secret that the market has turned. Some saw it coming, some hoped it wouldn't. It's a reality now. So where does the value lie in Buzzsaw now? We've all heard the saying, "Things change, but nothing changes". It holds true in this case. By using Buzzsaw now.........homebuilders can keep a very tight hold on their bid process. Having instant access to bid numbers.......perhaps being more selective in the trade partner selection because the numbers are at their fingertips. We aren't chasing the paper any more. Maybe the person who served as your "Document control" is no longer in that position. Or maybe there never was a person who was "officially" in charge of distributing and accounting for paper-based plans, and all of the changes that occur during the life of a project. Or the people who managed bid collection with paper are now performing other duties, or no longer with the company. Business processes - What's the value of RFIs running their course, and closing out an average 2 or 3 days earlier than they used to? No longer paying couriers and losing the day or two for the recipient to respond. The more savvy Buzzsaw users have even had other paper-based processes turned into "Buzzsaw Business Processes". You know, those forms we fill out, send through inter-office mail.........never knowing where they are, who has seen it, when should you expect to get a response from it? We have these capabilities with Buzzsaw. Groups - For whatever reason, ABC Framing (fictional framing company in Anytown, USA) is no longer doing your framing. Now......we remove them from a group in Buzzsaw and plug in the new Framing Company, and they're off an running. They have access to all the plans that ABC Framing did. They have a bid deposit folder, just like ABC did. And the best part, 3 or 4 clicks of the mouse did it! Cloning - No, not livestock. Projects. You just closed out a community. You were pleased with all (or most) of your trade partners. Want to use them for your next community? We'll clone the community that just closed, thus creating your new community. All of the players from the closed community are now here in the new one........all folders, files, permissions, business processes, ready for use. No reinventing the wheel here. Corporate Offices and the Satellite Office - The standard requirements: An internet connection and a PC. Now, everyone is one the same page. With Buzzsaw as the centralized location for all project activity, Corporate Offices, Satellite Offices, Field Crews, and all other project members to have access to the latest electronic documents regardless of their geographic location. Electronic Review - Trade partners have questions about plans, or find discrepancies in the field. They no longer markup paper and figure out a way to get it into your hands. They make notes and markup using Autodesk Design Review (Free for everyone), and relay the markups to you via Buzzsaw. They don't wait for hours or days to get a response, and work doesn't stop while waiting for the paper to reach you so that you can reply. We're just scratching the surface here. By using the basic Buzzsaw tools and following a "Best Practices" protocol, Buzzsaw stands tall even when the housing market has weakened. A new feature has been added to the latest version of Buzzsaw (version 2008.1) released on January 12, 2008. We can now link to files on the Buzzsaw site directly from a Buzzsaw form. You are linked to a specific version of the file. If the file changes, and you are accessing the file by the link embedded within the form, you we be viewing the original version.....not the updated version. This would be an instance when you would want to lock all files that are linked in forms to prevent changes to this linked file. Permission persist. If you link to a file that someone doesn't have permission to view.......they still cannot view the file. Be sure when linking to files from within forms that the members involved with this form have access to the files you are linking to. If the file is moved from one location on Buzzsaw to another location, the members involved with this form can still access it, if they have permissions to view the file in it's new location. Here's the scenario. You have 10 associates reviewing 1 PDF document. You'd like to preserve all markups/comments from every reviewer. In other words.......nobody should be able to delete the comments of another reviewer. We'll put our markups on their own layer such as "Bob's Comments" or "Jane's Calcs"
All 10 reviewers would have their own markup layer.........protected from deletion, a permanent part of this PDF! Have you ever started a new Form (aka "Business Process") and then scrapped the idea after you already started filling in some of the fields? Then you found out the hard way that the number assigned to that form, is now gone. It may have been assigned # 1000. But now that you deleted that instance of the form, the next time you press "Add" to start a new form........the number will be 1001. Maybe this is a big deal, maybe not. If you want to maintain a continuous stream of numbers for your forms (like a checkbook), then it's a big deal. Here is what you can do. As soon as you click "Add" to start a new business process, click "Save as Draft". You can then "Edit" this draft at an time to complete this particular form........and the kicker is.......the number is always going to be there for you. No more "lost" numbers!